Performance incentive programs are a good idea – except when they aren’t. The Insider has always viewed such programs with ambivalence: yes, it’s a good idea to reward employees for safe performance over a given time period. The problem is that these programs can discourage employees from reporting legitimate injuries. And the employee who does report an injury – the guy or gal who breaks the string of injury-free days – may incur the resentment of fellow workers. “You blew the pizza and the draw for a TV because you cut your hand!” It can be yet another form of the great American tradition, blaming the victim. At the Smurfit-Stone Container Corporation, the performance incentive program rewarded managers for not reporting workers comp claims. The company’s motto is “solving it from all sides” – and it appears that one of the sides is, well, illegal. David Polk, 53, and Douglas Tateoka, 61, pleaded no contest Wednesday to charges of concealing events related to on-the-job injuries and conspiring to deny injured workers their benefits. The two are scheduled for sentencing May 20 in Monterey County Superior Court. 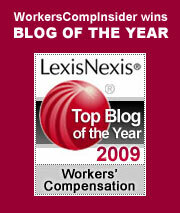 Employees were discouraged from reporting workers comp claims. When injured, they were treated outside of the comp system: the employer took care of the medical bills. It’s not clear whether any attempt was made to pay indemnity for lost time. I doubt it. As is usual and customary in California, doctors figured out a way to make a few bucks in the scam: in this case, Steven Davis of Davis Chiropractic, who once worked for Surfit-Stone as a human relations manager, and Eugene Guzman, a physician’s assistant at Pinnacle Urgent Care. Both are facing charges in the fraud. Any performance incentive program that focuses exclusively on managers is immediately suspect: a legitimate program rewards workers first, then managers, for good safety performance. Performance incentive programs have a positive role in many workplaces, but it’s crucial to align the incentives with the realities of the workplace. These programs should celebrate safe performance without penalizing or ostracizing employees who suffer injuries on the job. Beyond that, performance incentives must never trump employee rights under workers comp laws. It’s one thing to reward safe performance; it’s quite another to stifle claims reporting and the awarding of statutory benefits. Managers at box manufacturer Smurfit-Stone tried thinking out of the box to lower their comp costs. Now they are on their way to a concrete box with bars on the windows. They are about to participate in a very effective performance disincentive program, one that most of us try diligently to avoid. This entry was posted on Monday, March 29th, 2010 at 11:50 am	and is filed under Best Practices, Business. You can follow any responses to this entry through the RSS 2.0 feed. Both comments and pings are currently closed.